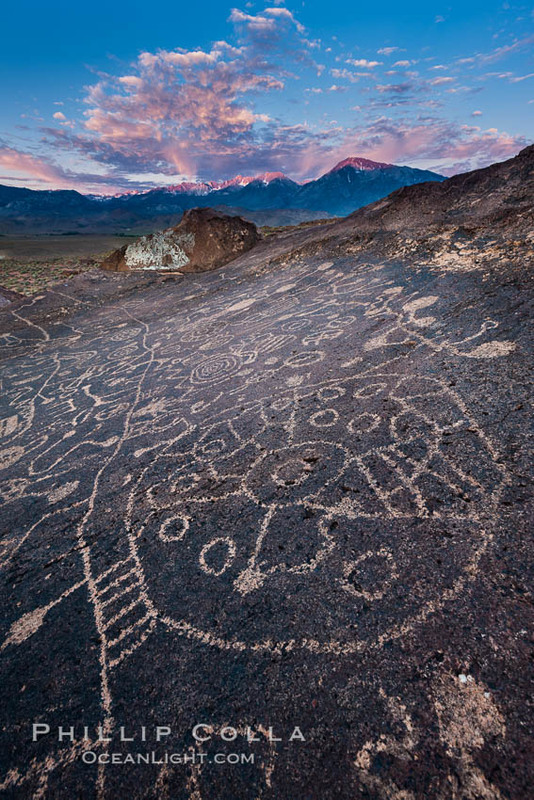 Photograph of Sky Rock Petroglyphs, Bishop, California. For some years I’ve wanted to see the Sky Rock Petroglyphs, a secluded and unusual set of petroglyphs located in the Volcanic Tablelands near Bishop, California. The Sky Rock Petroglyphs sit atop of an enormous volcanic block. The petroglyphs — dozens of them in many shapes and forms — face the sky, thus lending Sky Rock its name. My understanding is that Sky Rock’s orientation toward the heavens is unusual, but also curious is that this set of petroglyphs sits alone, isolated some 5+ miles from the rich Chalfant, Chidalgo and Red Rock petroglyph collections. Chipped into the rock, through the darker “desert varnish” that typically covers the exterior of such rocks, the Sky Rock Petroglyphs expose the lighter-colored rock underneath. The history of Sky Rock is not clear to me, although I have seen a number of published suggestions that the Sky Rock Petroglyphs were perhaps created by ancestors of what are today known as the Owens Valley Paiute (or Shoshone-Paiute) people. Sky Rock is a special place, indeed. It was fascinating to see it firsthand and consider the artist who, probably many hundreds of years ago, composed the intricate petroglyph forms. While looking at it we realized very few, if any, of the shapes were recognizable. In the way that other famous artists in history have done, Sky Rock’s talented creator produced a work that captivates and intrigues and will outlive him for centuries – a distinction that most artists (and photographers) hope to achieve. Thanks for looking! I have a few more Sky Rock Petroglyph photos. Also see my gallery of California photos and Sierra Nevada photos.